A mammogram is a safe test used to look for any problems with a woman’s breasts. The test uses a special, low-dose X-ray machine to take pictures of both breasts. The results are recorded on X-ray film or directly onto a computer for a radiologist to examine. 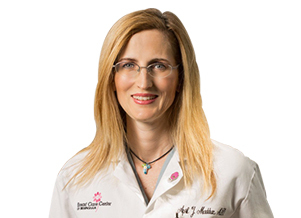 The recorded results will allow the doctor to have a closer look for breast lumps and changes in breast tissue. They can show small lumps or growths that a doctor or woman may not be able to feel when doing a clinical breast exam. Screening mammograms are done for women who have no symptoms of breast cancer. When you reach age 40, you should have a mammogram everyone to two years. 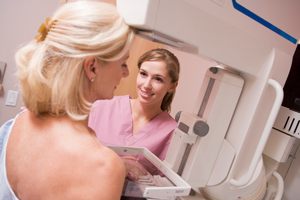 Diagnostic mammograms are done when a woman has symptoms of breast cancer or a breast lump. Digital mammograms take an electronic image of the breast and store it directly in a computer. You will be asked to stand in front of a special X-ray machine. The radiologic technologist places your breasts one at a time between two plastic plates. The plates press your breast to make it flat. You will feel pressure on your breast for a few seconds. The flatter your breast is between the plates, the better the picture for the doctor to review. Most often, two pictures are taken of each breast, one from the side and one from above. A screening mammogram takes about 15 minutes from start to finish. Be sure to get a mammogram from a facility certified by the Food and Drug Administration (FDA). These places must meet high standards for their X-ray machines and staff. Check out the FDA’s web site on the Internet at: http://www.fda.gov/cdrh/mammography/certified.html for a list of FDA-certified mammography facilities. Your health care provider, local medical clinic, or local or state health department can tell you where to get no-cost or low-cost mammograms. Also, call the National Cancer Institute’s toll free number 1-800-422-6237 FREE for information on no-cost or low-cost mammograms.